Free Djarum Assortment With Carton Purchase! Buy a carton of Djarum Filtered cigars, get a Djarum Assortment Pack, valued at $15.00, absolutely FREE! 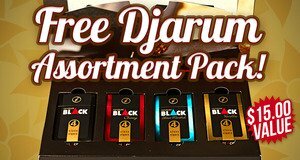 Free Djarum Assortment Pack With Carton Purchase!